OK first and foremost this post is not a review of a pattern and certainly not a moan about one! Every month I get a copy of Love Sewing magazine and there is always a great free pattern included. (By free pattern I mean a proper pattern, in envelope etc.) made by SimpleSewPatterns and have always been fantastic: I know as I have made lots of them! As always, this months Love sewing came through the door (YES I did win the Star Make prize!) and straight away I showed the pattern included to my wife. 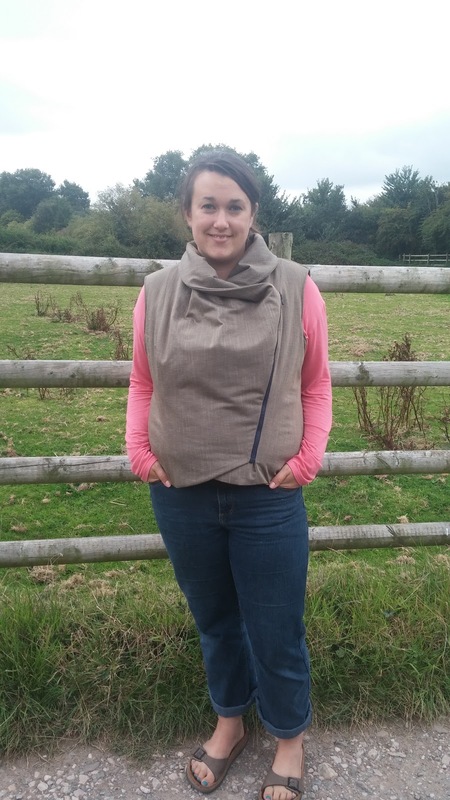 A slouchy Gilet. I loved it and so did Lu. Up to the sewing room I went and picked some lovely cotton/silk/linen mix fabric with an autumnal print lining. 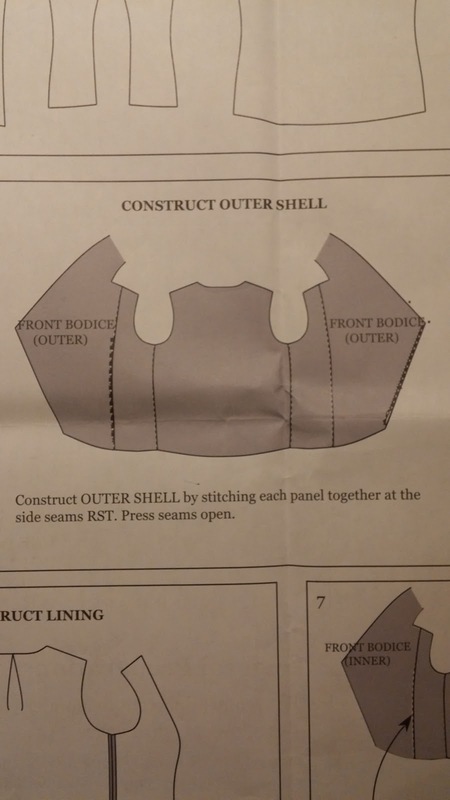 I opened the pattern and got ready……. Now I class myself as experienced when it comes to sewing. I regularly make ‘Advanced’, ‘Expert’ patterns: To be honest I normally draft my own but this pattern had me stumped! How hard can it be? 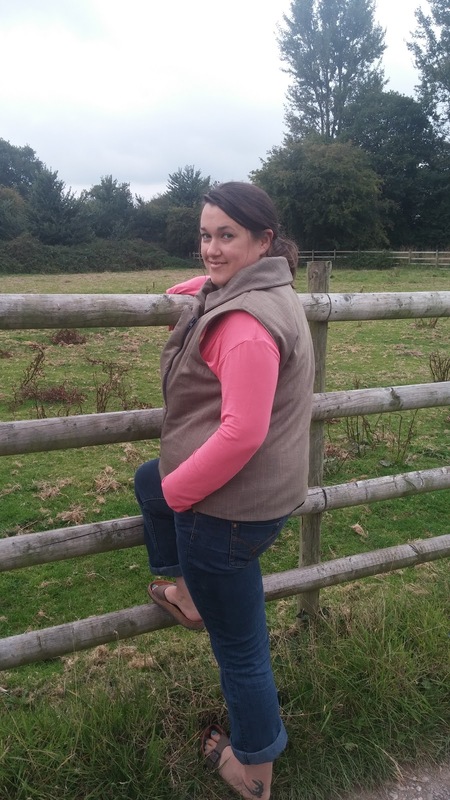 It is a pattern for a Gilet! No Sleeves, no complicated seams or anything else……. Now before we start I just want to say I did not use the suggested fabric (Knit) and I padded my version ready for autumn (1/4 in batting) but the rest was the same. I also want to say that my method of construction may be massively different to what the designers thought. I am writing you this post in the hope it might help you to make, what I think is actually a good pattern. PS my drawings are not that good! I read the instructions…over…and over…..and over but many things did not make sense. I opened the pattern; again I was confused. I put the garment together in my head and came up with the following. I cut the pattern, to Lu’s size and had all the pieces ready…..
How? The illustration does not show how to put the zip in. The instruction was small and vague. The pattern piece had no markings at all for zip! 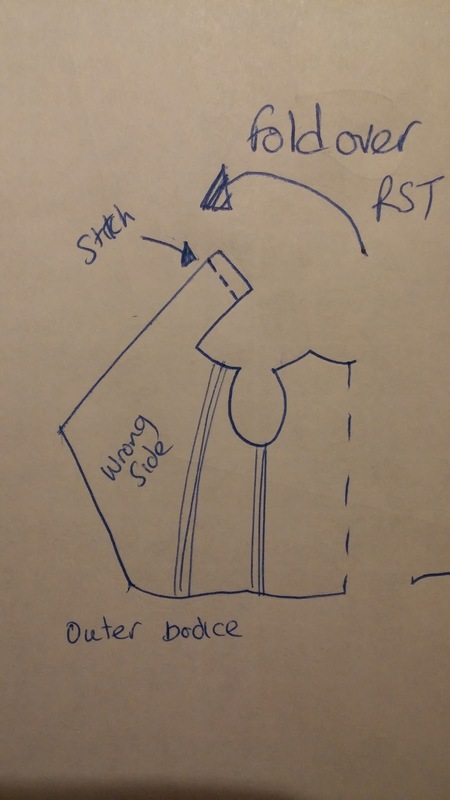 So pin the RH zip (the thin zip bit) to the front RH. Sew zip 1/8 inch from zip teeth and make sure this stitch is 5/8 from edge of fabric. (My drawing is based on the zip I used. Yours may be different) The bottom edge of the zip needs to be at least 5/8 inch from the bottom! Step 2. 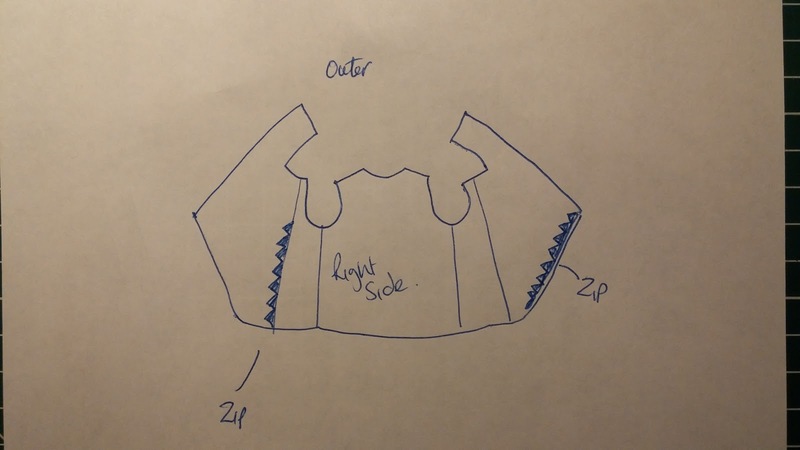 Do the same for the LH zip (the zipper part) on the LH bodice piece. Keep the same space from the edge but put the bottom of the zip where the pattern shows! You will need to bend the zip and pin/baste well around the curved seam. Step 3. 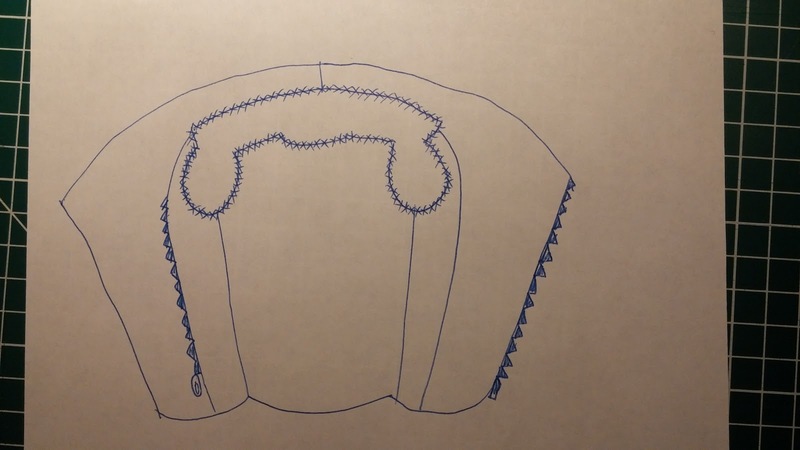 Sew all outer fabric pieces together (this is easy) however the front and side pieces do not have any markings to line up and as this is a princess seam I thought there would be a few more! Line up the middle piece with the front but take it 1/8 inch above the top of the front piece. 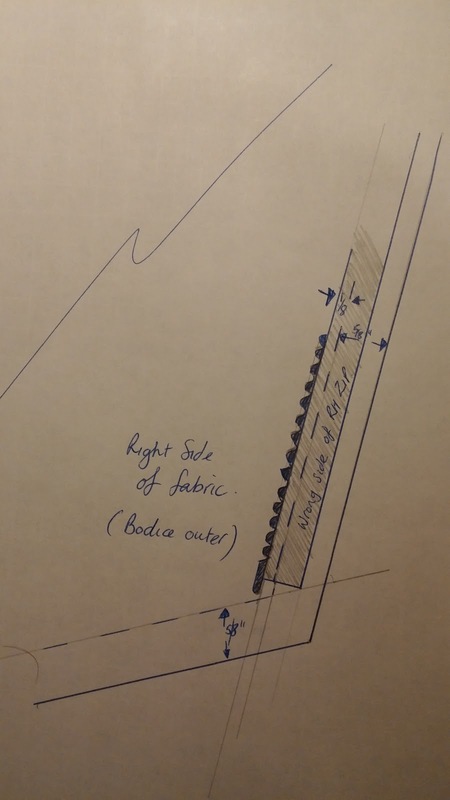 When you sew the 5/8 inch seam, it should start where the side and and front intersect at the top. Step 4. 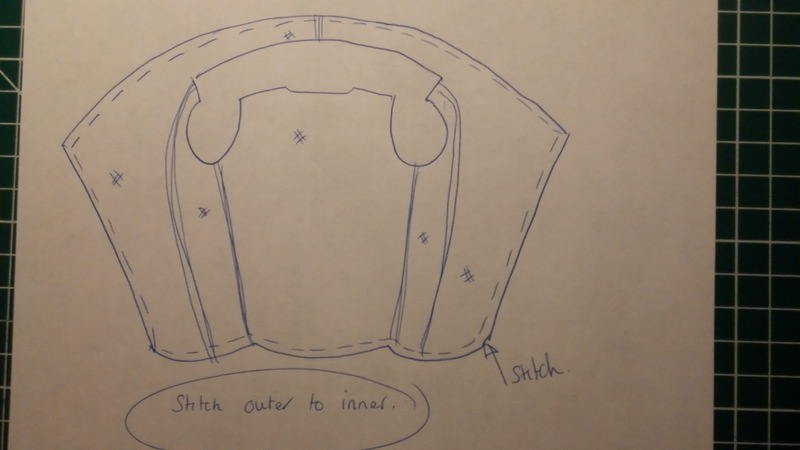 Now the instructions say to pin and stitch the facing (inner fronts) to the fronts. STOP! Don’t do it! I really saw no point in doing this as later you need to stitch in the lining to the facings and it will be really difficult to do well. 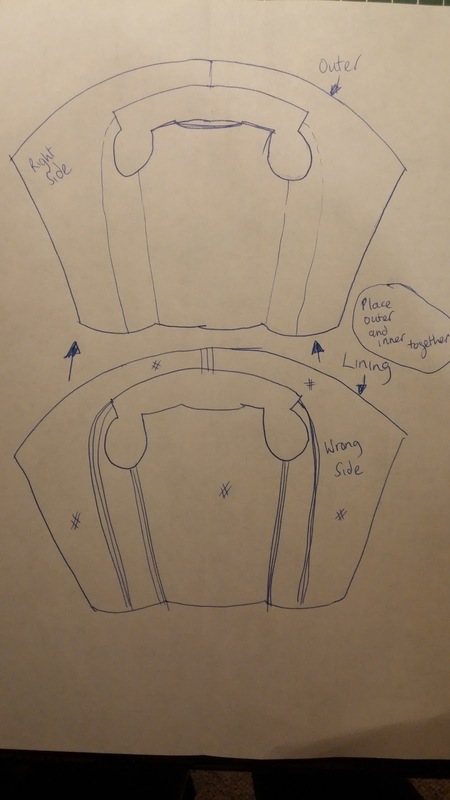 Instead make up the lining but add the facings so you have 2 identical parts of the Gilet. One outer and one inner. You might get stuck with the back lining piece. 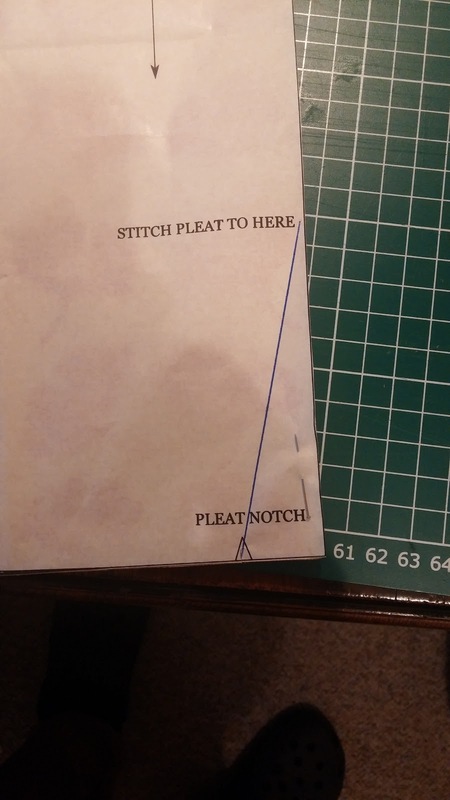 The instructions tell you to add a pleat. The pattern looks like this…. This is poor. 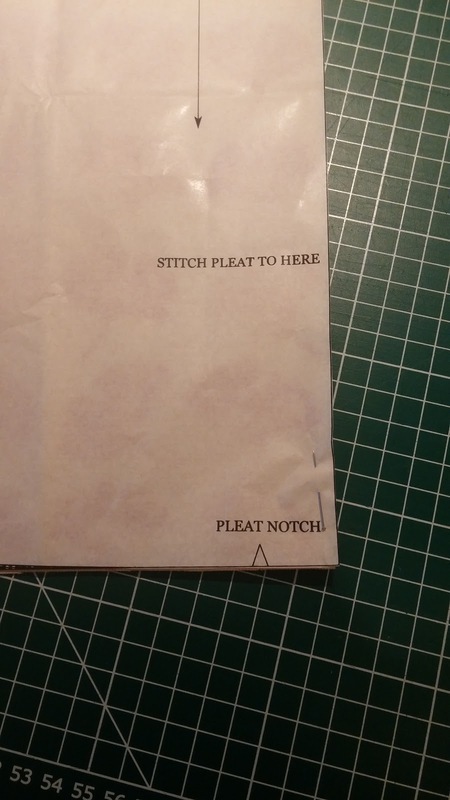 “Pleat notch” and “Stitch pleat to here” are the only markings. What sort of pleat? Box? Godet? Knife? Pinch? I opted for a pinch pleat. 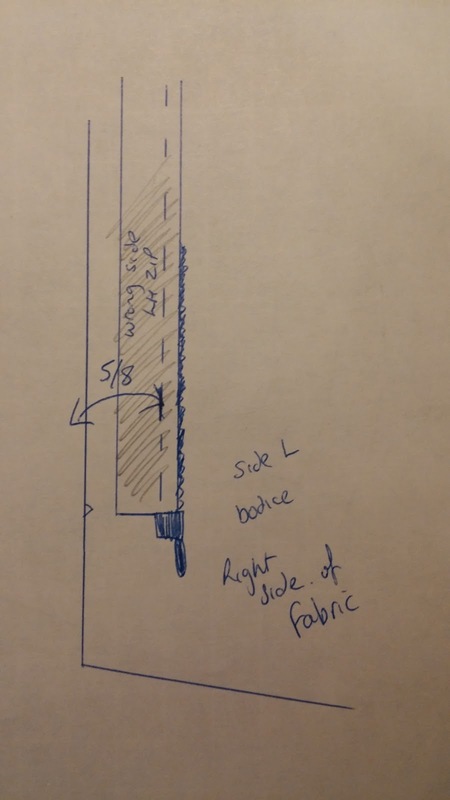 sew a line (with fabric folded) from the notch, to the “stitch pleat to here” marking. Right you should now have a front (5 pieces and 2 zips) and a lining made with 5 pieces. Now you need to sew the neck on each piece. RST. I am not sure why the pattern instructions do this later as you would end up with a visible seam?! Call me old school but seams should not be seen, including the horrible overlocked type! (just my view). 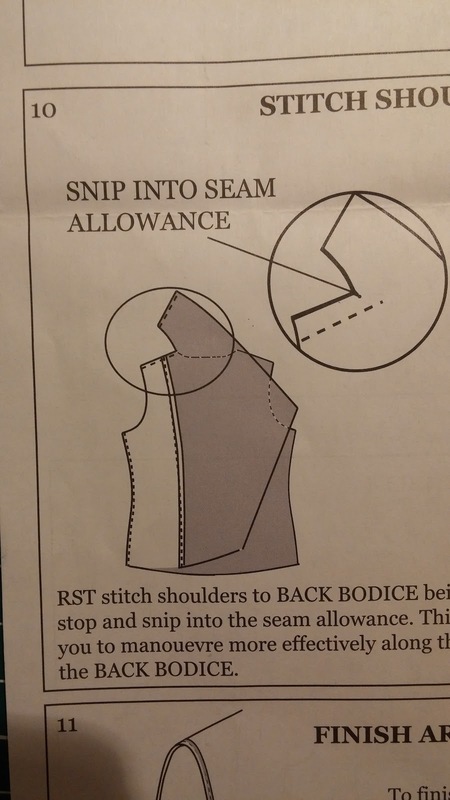 So sew each neck seam front and lining. Pin RST, sew and press open. Pin and sew around the edge at 5/8 inch. (Be careful when you come to the zip on the edge!). Clip and trim/grade all seams. Turn the fabric through the hole at arm/neck and press. 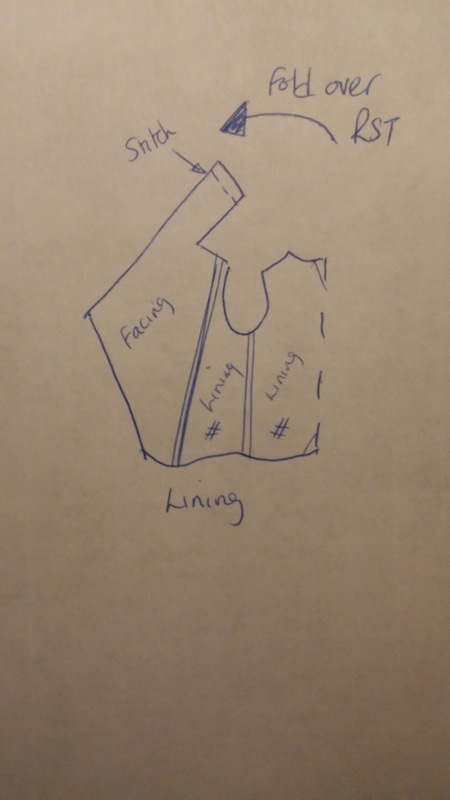 Overlock or zigzag the arm/neck opening together as shown in my picture. 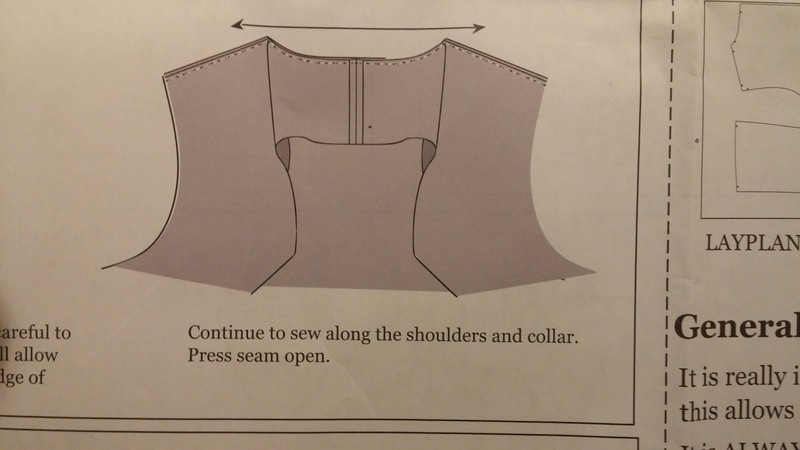 Now follow the instructions and sew the shoulder seams and clip the corner seam. As I said at the start of the post, this is not a review or criticism of what the pattern is but a helping hand to those who might want to make the gilet. My instructions might not be as the designer wanted but hopefully will be a little easier to follow. I am happy with my results and here are a few more pics…. Zipped up for the winter! Well I hope this helped if you are thinking of making this pattern and please do ask if you have any questions. What an unusual vest. 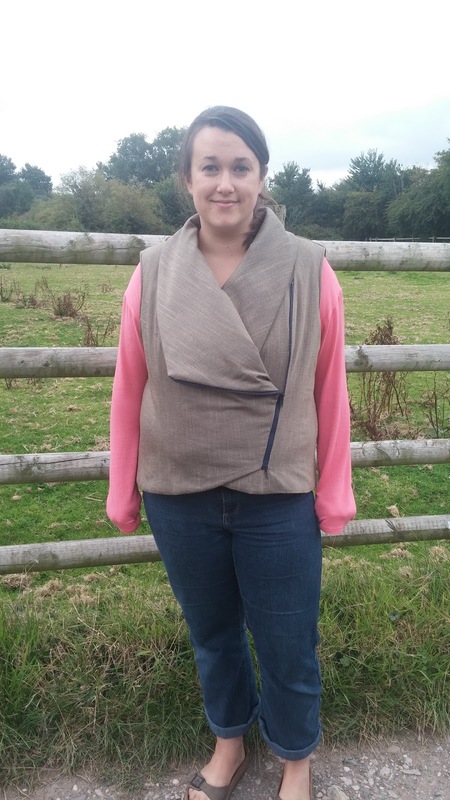 I think you should have chosen a polar fleece to make it out of that way you could skip the lining and used an overlocker for most of the project including flat locking to reduce bulk in the seams. Thanks for your easy to follow instructions. I got stuck at the zig zag around neck (I didn't do that but as I didn't want the neck seam exposed ) so I am now stuck unable to access to complete the armholes. Can you advise me? As a fairly good sewist I've been struggling with the pattern instructions for two days so far. The zip insertions had me scratching my head and attaching the lining at side seams was a nightmare. 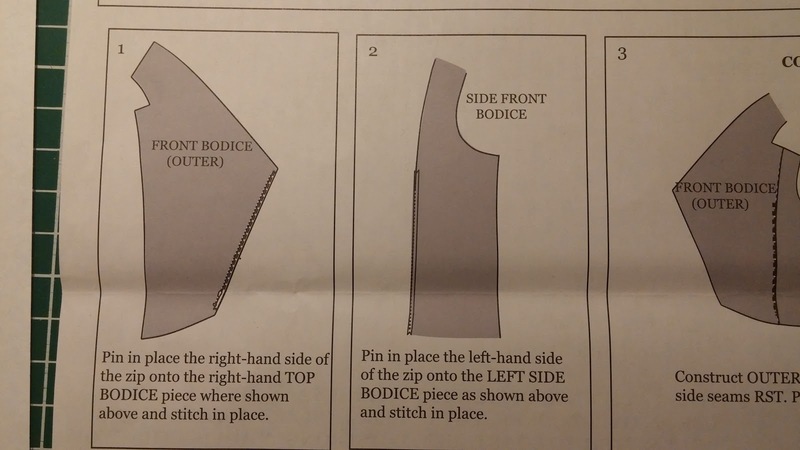 It's not a difficult pattern, just so much of the instructions have been missed out. I then tried to look for comments on the internet and found your post. As I'm just about to "stitch all along the bottom edge" I've decided to follow your guidance and sort the shoulders and collar first. I've never had such a problem before. I have a few "free" Simple Sew patterns and hope they're not all as poor. Thanks so much for your help. 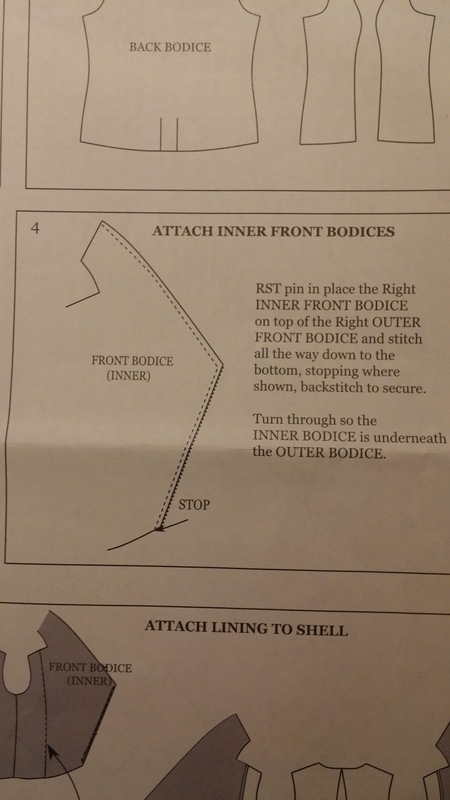 Thank you for this brilliant explanation- I'm half way through the pattern and worked the zip positioning out. Will keep a close eye on your instructions as I progress. 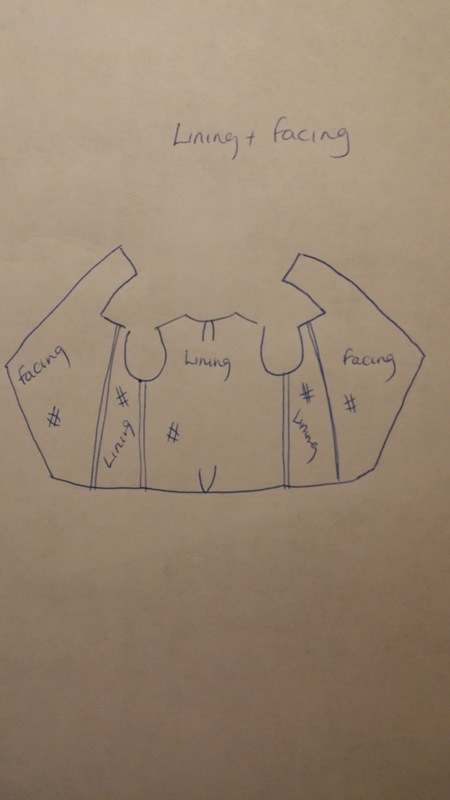 Generally Simple Sew patterns are exactly as described….simple. I can only assume they were having an off day as the instructions for this are awful. Wish I’d found your post before attempting to put mine together. Zip is in back to front and only does up from the inside. Will be hand finishing the shoulders and neck!